A white stone tablet with plain pediment supported by bas relief carved pillars. The inscription is on the lower half of the tablet. 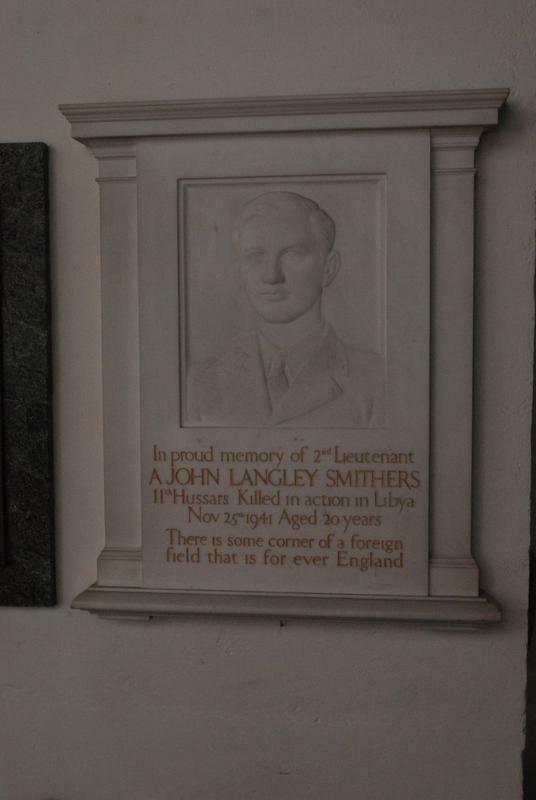 IN PROUD MEMORY OF 2nd LIEUTENANT/ A JOHN LANGLEY SMITHERS/ 11th HUSSARS KILLED IN ACTION IN LYBYA/ NOV 25th 1941 AGED 20 YEARS/ NOV 25th 1944 AGED 20 YEARS/ THERE IS SOME CORNER OF A FOREIGN/ FIELD THAT IS FOR EVER ENGLAND. 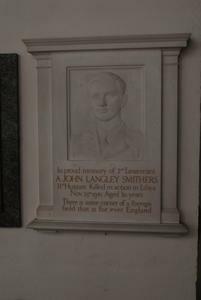 Information shown: Forename, surname, rank, regiment, date of death, age at death.